KITCHENS ARE INVESTMENTS SO RESEARCH IS NEEDED TO ENSURE YOU ARE OBTAINING THE BEST VALUE FOR YOUR BUDGET. All Lanxin cabinets are made of 100% real solid wood. Absolutley NO MDF, PARTICLE BOARD, MELAMINE OR CHEAP FILLER MATERIALS used in any section of the cabinets. A solid natural wood face frame adds to the structural integrality of the cabinet and also a firm anchor for the door hinges. Doors that are mounted on the face frame are extremely strong and will not warp or flex over time. 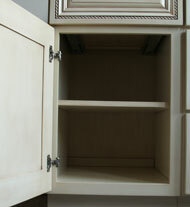 On many competitor cabinets the door hinges are mounted to the actual cabinet body which is usually MDF. This creates a weak anchor for the doors to rest on particularly if they are larger solid wood doors that can have some weight to them. This may cause the doors to flex and loosen over time or even fall off on low end products over time. Dovetails cannot be imitated and are easily recognized. Examination will also show that the drawer box is 100% natural solid wood as the natural wood grain can be visible at the cut ends of the joinery. Having a heavy drawer full to the top slam into the cabinet not only creates a large annoying sound but also places a high degree of impact force onto the cabinet itself. The solid natural wood face frame definitely helps impact resistance but so too does the soft close mechanism that allows the drawer to slow down before impact and self-close eliminating all noise and impact pressure. Also a great feature to show guests as they will be impressed with the advancement action of the feature in use. Having access to the entire drawer does not only help in the functionality of your kitchen it adds value and in an important piece of the cabinetry since drawer bases are more expensive then a regular door cabinet. Full Extension glides allows for easy access and organization by allowing the entire drawer box to exit the cabinet so nothing gets lost in the back portion hidden under the cabinet framework. Thick plywood prevents warping and is very important to the structural strength of the cabinets especially holding a granite or quartz countertop. Furniture grade uses harder woods for the ply construction, thicker veneer and there is less gaps in-between each layer. Quality plywood has better strength and resistance to water and extreme heat. This is a large upgrade from MDF which is a sawdust and glue composition that does not yield the same strength and durability, though equal material comparisons have MDF as a much lower cost the final cost in cabinets can sometimes match the costs of our low and medium cost cabinet models that are without any MDF or low cost materials. Miter Doors are doors that have the corner joints cut on a 45 Degree Angle. Most simplified doors use a tendon construction that has each side of the door interlock. We have tendon doors too but miter doors are used if you want the most detail in the door and many of our mitered door cabinet models will feature not only highly detailed doors but also include antique glazing for a classic aged appearance. Crown molding and under cabinet light rail is all 100% solid natural wood and available in different design patterns and sizes. 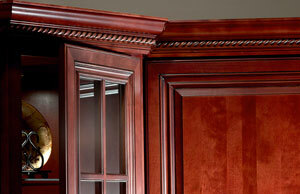 Our molding does not come from a secondary source and is part of the cabinet model’s options list. Crown Molding can be used to have your upper cabinets reach the ceiling or just to help accent the cabinet and add appearance. Using an alternate level design that features wall cabinets of different heights will increase the appearance level of the kitchen and molding. Light Rail will give wall cabinets a cleaner finished look as well as hide any under-cabinet lighting. Our light rail molding has a low profile unlike in the past that used larger molding which grabbed too much attention our light rail molding combined with or cabinet construction allows plenty of space underneath for lighting without the need for large molding to conceal it. Adding in glass doors to key areas of your kitchen or dining room cabinetry can greatly increase the appearance of the overall kitchen and even just one glass door on a corner diagonal wall cabinet can make a large impact on the overall kitchen design. 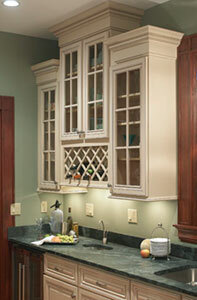 CORNER SHELVES, ROLL OUTS TRAYS, WINE RACKS, PULL OUT SPICE RACKS & MUCH MORE AVAILABLE TO INCLUDE IN YOUR KITCHEN DESIGN. 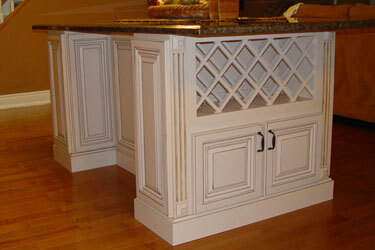 There are many options to customize your kitchen and increase the usability of your kitchen. Ask at our showroom what features you would like. Wood species in all finishes will exhibit color changes when exposed to different types of light and environments over time. Through this natural process, graining differences, mineral streaks and color variations can be expected in wood cabinetry. Lanxin Cabinetry's door styles often exhibit these natural and beautiful characteristics that are inherent in all wood cabinetry. Understanding these unique variations will give you greater appreciation for the natural beauty of wood cabinetry.Please take a moment to discover the natural traits that are most common in your favorite wood species. We encourage you to view a door sample in a natural finish and discuss the wood species with your kitchen design specialist to ensure you are comfortable with these natural characteristics prior to ordering. Lanxin Inc reserves the right to change specifications without notice. Illustrations and descriptions are for guidance only and are subject to alteration. The reproduction of any portion of this website in any form, including photography and imagery, is strongly prohibited. © 2013 Lanxin Inc, All rights reserved.